mmm mmm good! I just bought a ton of arugula from Sprouts!! Perfect! I honestly didn’t think I’d like arugula but it works perfectly in this salad! Wow, deliciousness!!! Awesome recipe!! I like arugula aaaand my favorite products from Trader Joe’s…Goddess dressing, peanut butter, pretzel rolls, and lots more!! XOXO!! Happy Monday!! I know!!! I love so much!! The dressing is delicious!!!! Who knew arugula could make such a difference! I love arugula but I’m sad to say I live nowhere near a Trader Joes 😦 Oklahoma is dumb. GAH how do you survive?! Just kidding of course 🙂 Trader Joe’s makes things easier but it’s not life or death. Start a petition! If you could only find a balsamic glaze of some sort you’d be golden! But yeah Trader Joe’s just makes it all so easy! Well hello tasty salad salad! Caprese salad isn’t that well known over here, but it should be! 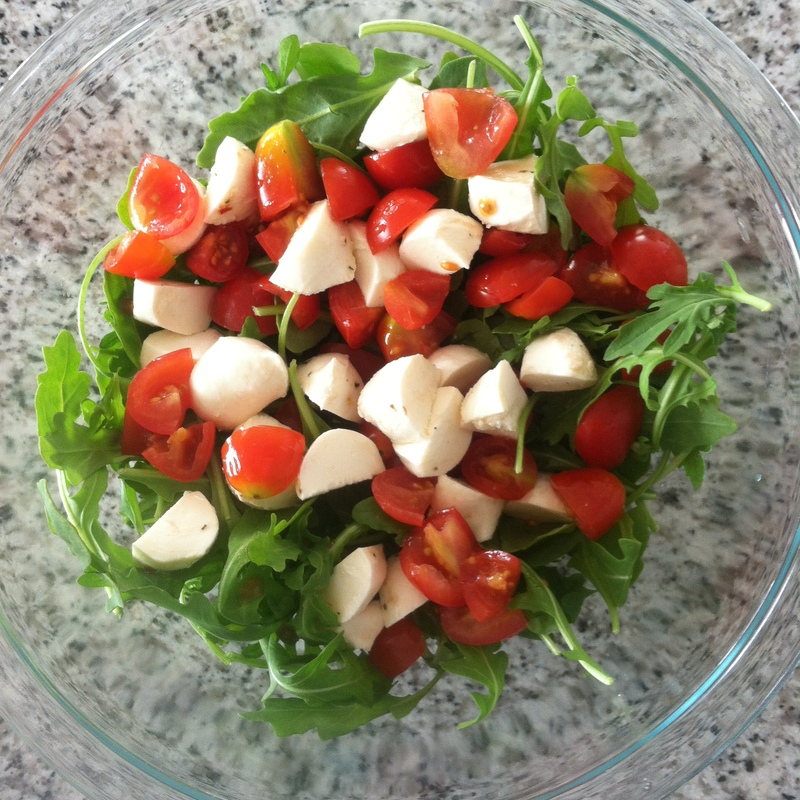 and I love rocket (arugula) so I think this will be made soon! I do like a good arugula and a good balsamic glaze. My only issue with arugula is that it isn’t very filling. Womp wommmmmp. But I love it especially on pizza or as an accent note to things. Fave TJ product would be between a few things: I love the coconut chips (unsweetened) and the chicken sausages. They used to make phyllo crust pizzas and this spicy seaweed salad that I ADORED but the a$$hats stopped making them. I have realized that arugula isn’t very filling 😦 triple womp. Next time I make this I’m definitely going to make some garlic bread on the side or maybe a piece of chicken. Ah yes, smart to use the double salad!! YUM! I love TJ’s cheap produce, but I adore the dark chocolate salted almonds…..